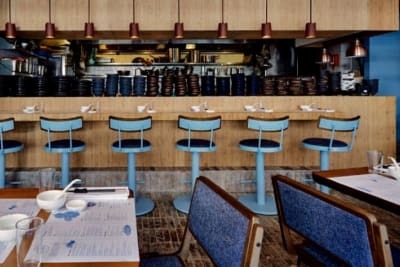 Bibo is one of those “blink and you’ll miss it” spots on Hollywood Road. Guests should first look for a bronze door, green tiles and a sign that says “Compagnie Générale Française de Tramways” (a nod to the building’s history). Then they should look for a hidden button on top of the bottom pole to open the door. This description might ruin some of the fun, but I think standing in the summer rain trying to figure out how to get in (like I did) is decidedly less fun. Guests are in for a treat once the door opens. 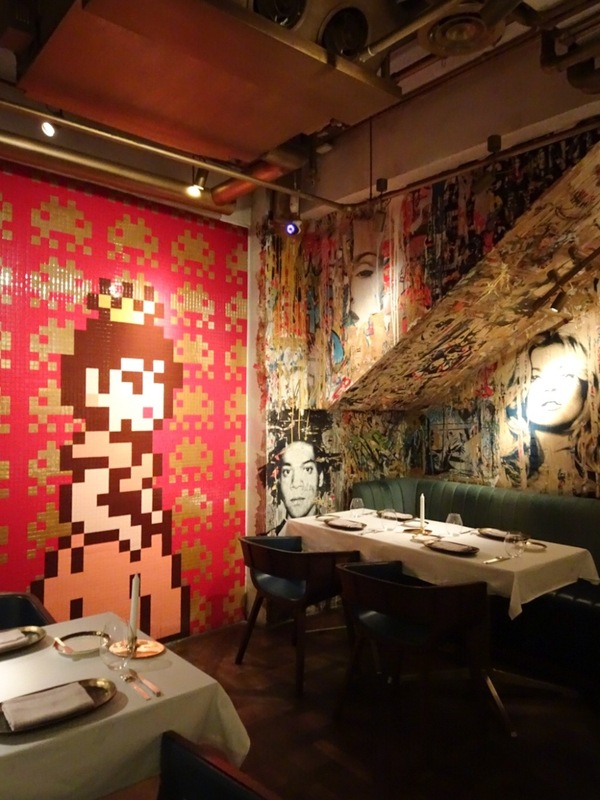 For those who haven’t been, Bibo is full of high-end modern art (think Banksy, Damien Hirst, Takashi Murakami, Pure Evil). Almost every corner is plastered with art, including the washrooms. It all kind of feels like you’re entering an artsy but damaged millionaire’s lair. 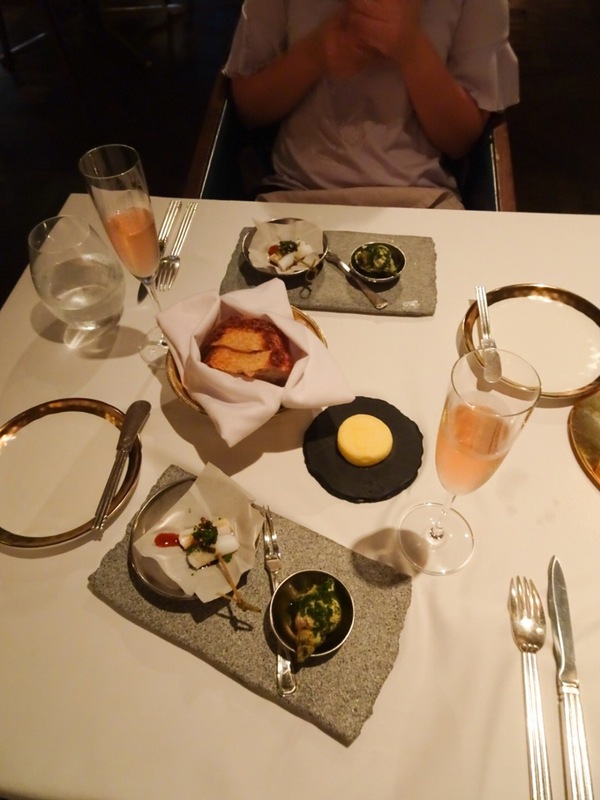 On the evening we went, we tried the Chef’s Imagination six-course menu ($898) with wine pairings ($488). 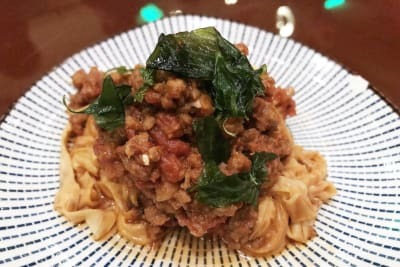 Recently, Nicholas Chew took over as Executive Chef, and now the French-inspired menu has Japanese and Peranakan influences. Overall, the Plats (mains) were nice. 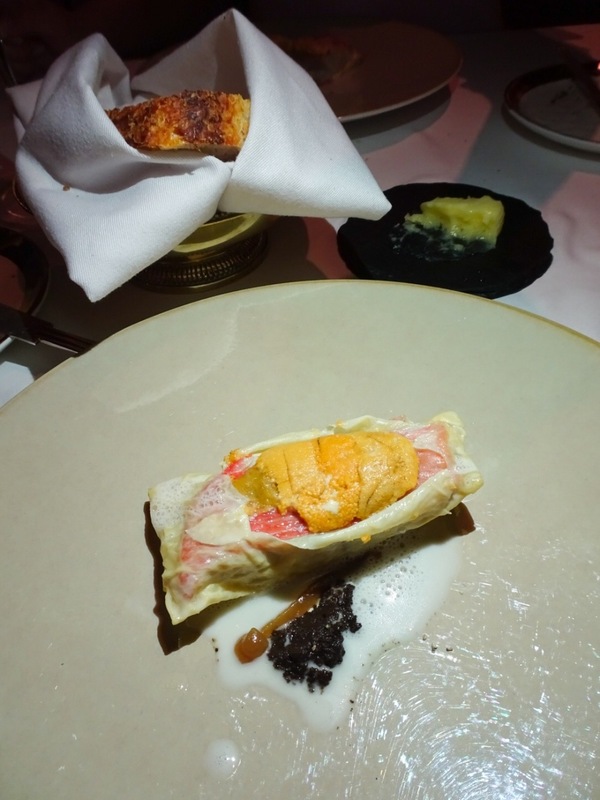 The turbot with uni and coconut ($468 à la carte) was well cooked, and the flavours were accented by a salty-sweet olive tapenade. 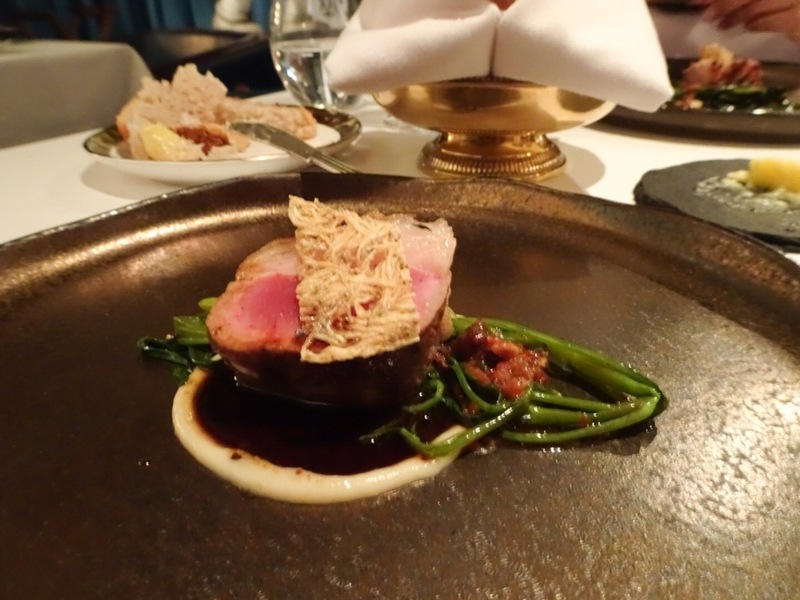 The lamb Aveyron ($488 à la carte) was tender and accompanied by water spinach in a house-made XO sauce that reminded me of my favourite Peranakan sambal kangkong. 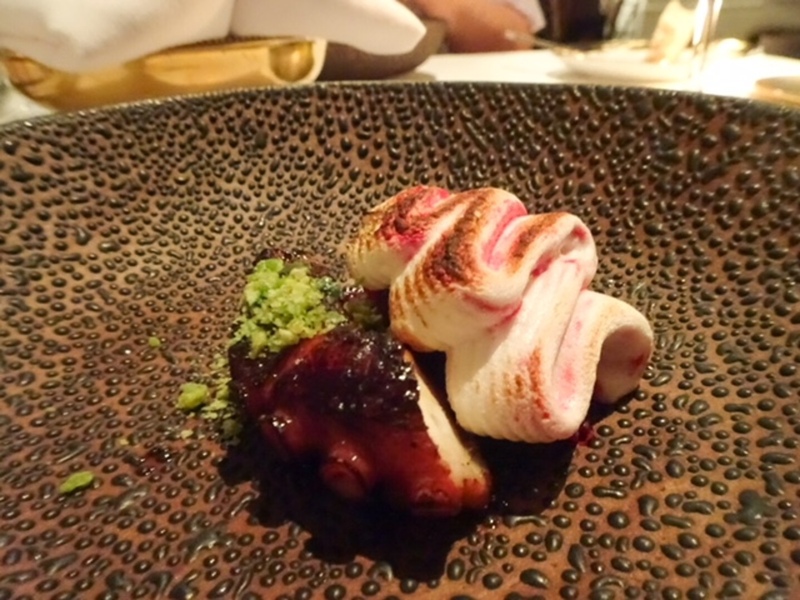 The octopus with beetroot meringue and horseradish ($368 à la carte) was an unexpected combination that worked. Also delicious was the celeriac risotto ($188 à la carte) from the Entrées section. The celeriac absorbed loads of flavour and the dish was exceptionally cheesy, but it was the slice of mango that elevated things, adding depth and creaminess without, surprisingly, being too sweet. However, I didn’t find the smaller dishes or desserts as satisfying. The bulot ($138 à la carte) and squid cheong fun ($198 à la carte) used lovely ingredients but tasted surprisingly bland. 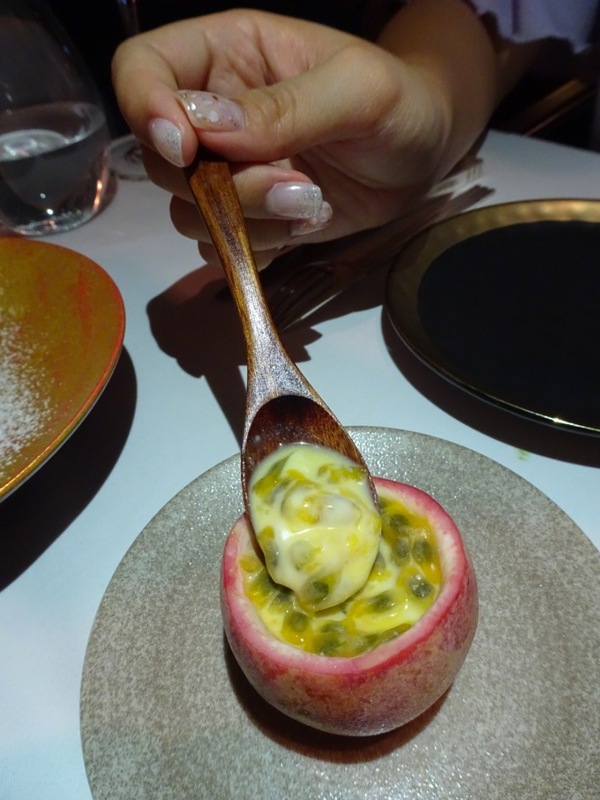 While the Cream dessert ($138 for choice of 2 desserts à la carte) – lime curd in passion fruit – was delicious, the other desserts were not memorable. Bibo has a funky new wine bar that was quite full on the Monday night I was there. There are over 100 wines available by the glass, from the affordable (two digits) to the luxe (four digits). While we didn’t sit at the bar, we did enjoy a wine pairing with the meal, and the sommelier was fantastic. He introduced a number of unique wines such as the Marc Kreydenweiss Moenchberg Grand Cru 2008 (like a caramely, aged white) – this went so well with the food that I definitely want to order it again. 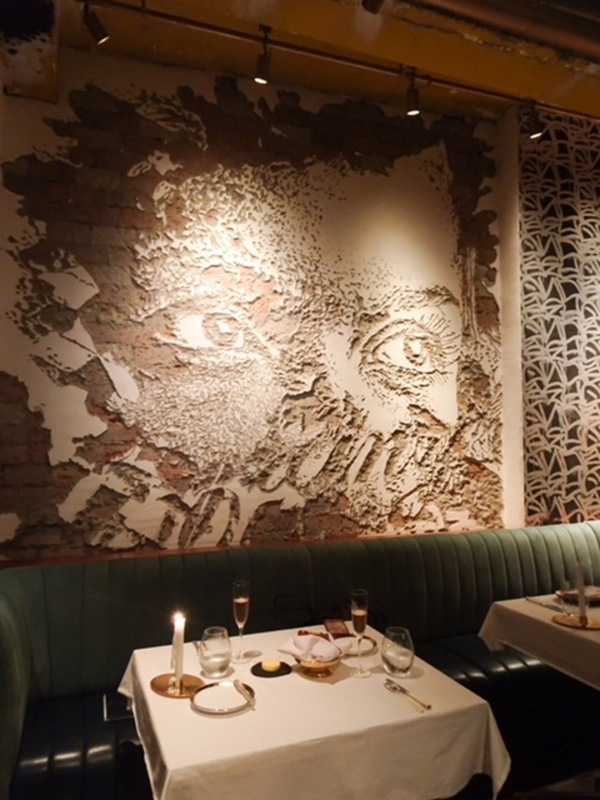 Bibo is undoubtedly a beautiful restaurant, the wine selection is top notch and the new chef is talented. However, my opinion is that the food was good but not outstanding. 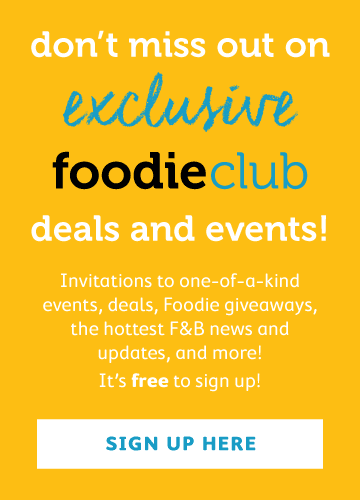 More than that, my biggest hesitation about recommending Bibo is the portion sizes. If I hadn’t eaten almost the entire breadbasket, I think I would have left hungry. 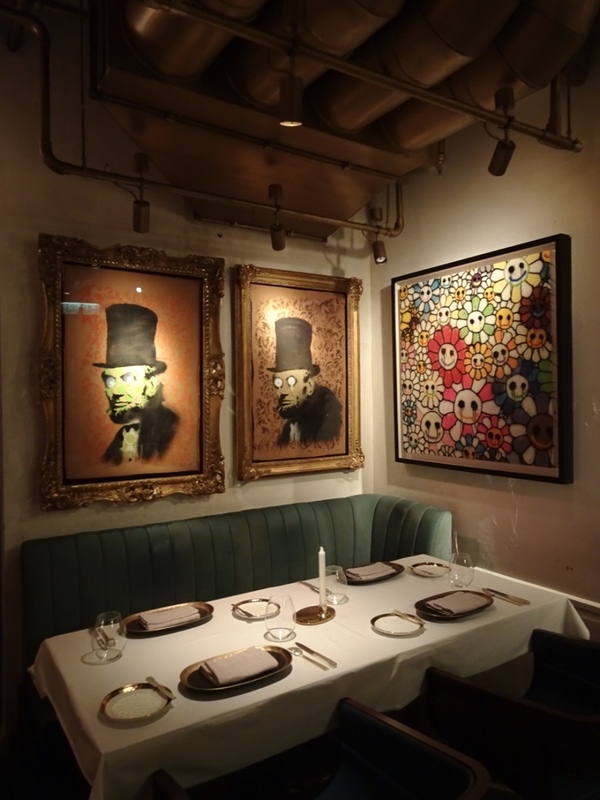 So if you don’t want to splurge on a meal, go and enjoy the art and wine bar at Bibo instead.